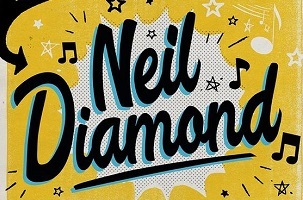 If you’re not doing anything this afternoon and have a special place in your musical heart for Neil Diamond, you might want to head on down to Flatbush. 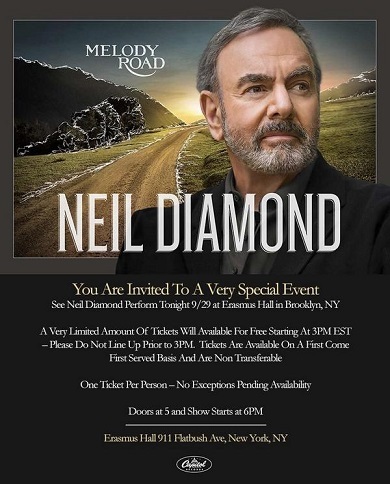 Per a couple of tweets earlier today, in this the new social age of music promotion, Diamond announced a surprise 6 p.m. concert tonight in Brooklyn at Erasmus Hall High School, where he was a student from 1954 to 1956. The performer is asking people not to line up before 3 p.m. for free tickets. If any FishbowlNY readers snag tickets today and attend, let us know how it was. The performer’s new album, Melody Road, comes out October 21. Other notable Erasmus Hall alumni include Clive Davis, Barbra Streisand, Bob Arum, Mickey Spillane and Barbara Stanwyck. He debuted a pair of choice cuts from his forthcoming Melody Road. “I love doing songs you know,” he told the crowd. “But I really love doing the songs you haven’t heard before — because those are the ones I get to sing alone.” (You have to admit — that’s a brilliant way to break the delicate news you’re trying out unfamiliar material.) And the new songs are top notch: “Nothing But a Heartache” is a bluesy stomp, while “Something Blue” has a lighter country lilt that evokes another Neil song with “blue” in the title. Both went over big — when the fans are clapping on the beat by the second chorus, your new tune is officially a success.